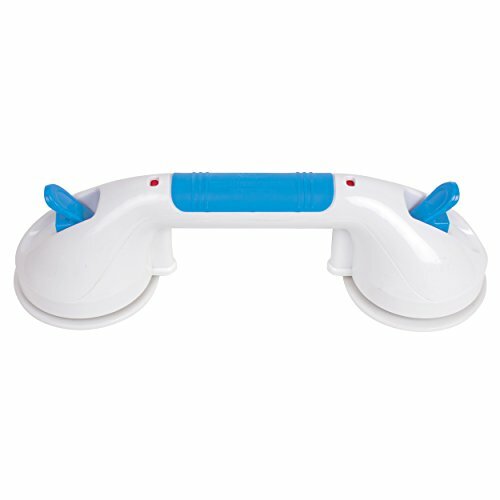 The 12 inch ultra grip grab bar attaches in seconds to most shower surfaces providing support in the bathtub or shower. Contains (1) Carex Ultra Grip 12" Grab Bar, shower wall grab bar. Features extra strong, dual locking suction cups for increased stability & indicators to show when the bar is locked. Easy to install & remove, & compact and lightweight for ease in travel. The 12" Ultra Grip Grab Bar assists users in safely entering or leaving the bathtub or shower. The ultra strong, dual locking suction cups provide a secure hold mounted to any smooth, flat, and non-porous surface, for safety and support you can rely on. The Carex 12" Ultra Grip Grab Bar features a visual indicator that turns from red to green when the bar is properly secured in place. Simply place it on the bathroom wall and flip the locks into place. When the indicators turn green, the bar is secure. Easy to install and uninstall, the Carex 12" Ultra Grip Grab Bar can be installed and removed without the use of tools. It's portable and compact, so you can take it when you travel & easily install it in hotel rooms or guest bathrooms. No tools, no fuss.